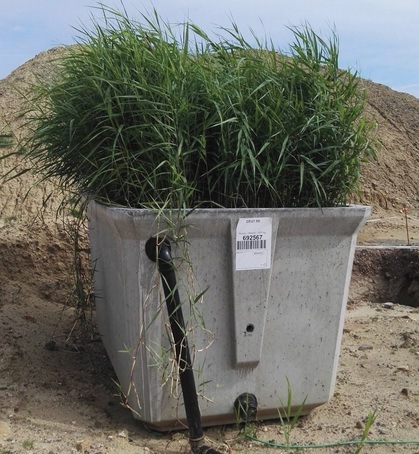 Phytocube is a compact, modular reedbed treatment system designed for low flowrates of wastewater. 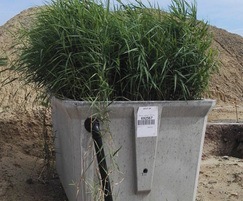 Suitable for single houses and small industrial applications, the Phytocube provides all the benefits of reedbed treatment technology within a small footprint. Multiple Phytocube units can be connected together to provide increased capacity, depending on the requirements of each project. Domestic wastewater is fed to a pre-settlement tank, where solids settle and the floating fat layer is separated. Existing septic tanks can be used. After pre-settlement, the wastewater is delivered to the Phytocube, which is filled with a planted media. Bacteria grow on the media and plant roots as a biofilm and consume the contaminants within the wastewater. Oxygen is supplied via a network of air lines at the bottom of the basin, which is connected to a small air pump. The resultant environment produces a combination of aerobic and anaerobic processes to create a rich diversity of bacteria in the Phytocube, which means it is capable of breaking down hard degradables such as pharmaceuticals. The standard sized phytocube will serve five to six people. The system is modular, so multiple basins can be connected to achieve the required treatment capacity for each project. Phytocube is supplied with an electronic control featuring alarm functions for the pump and air blower. The control is located in a stainless steel housing, suitable for exterior use. For situations where there is no daily flow of wastewater, a special electronic control can be supplied that switches the air blower on and off, depending on the treatment demand.